PROTESTERS CLAIM DOGS KILLED MAN! THE death of a man who was allegedly mauled to death by dogs sparked chaos. Residents claimed a man from Kenville squatter camp in Durban was bitten by the dogs on Friday. Yesterday residents protested outside a truck company where the 15 dogs live. They said the dogs often leave the truck company’s premises to wander the streets. A protester said several residents had been bitten by the dogs, and the owner of the company was allegedly aware of the incidents. “We’ve been asking him to lock his gates so the dogs don’t get out. “He was told that if he can’t lock his dogs inside he should take them away, but he didn’t listen. Now a man has died,” he said. The protester said residents were told the man who died was also from the area, but they are still searching for his family. “He was walking past the company premises when eight dogs came out and bit him. “No one rescued him because everyone was afraid of the dogs,” he said. A protester who was injured by the forklift was taken to hospital. 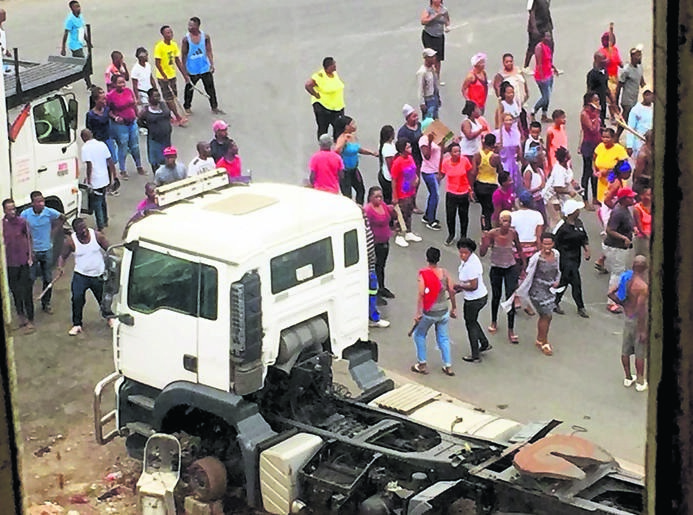 Mbele said eight people were arrested for public violence and will appear in court soon. She said she did not know whether the man who had died was mauled.